LOCALDIGGERS PLANT HIRE offer the hire of Mini Diggers, Excavators and Plant equipment, either operated or self drive in the Surrey and Sussex area. Excavation and burial of pipework, water work and electrical line. Hire rates, details for Digger with driver included. Hire rates, details for machinery and diggers only. 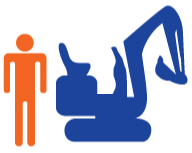 We have vast experience in hiring excavators of all types to customers ranging from contractors in the construction industry to the Trade & public. We always supply a prompt, reliable and helpful service at all times and confident that our equipment is of the highest quality and our standard of service is second to none. 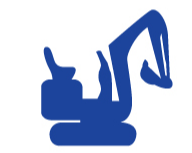 We have excavators ranging from 3/4 ton to 14 ton including; mini diggers, backhoe loaders and dumpers.